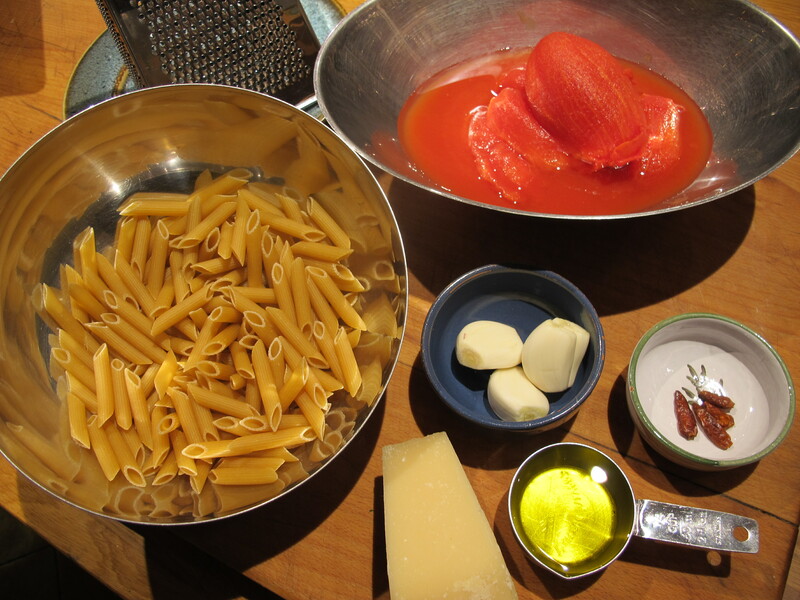 Farmhouse cupboard fare: Olive oil, garlic, tomatoes, chilis, pasta and parmesan–that simple! A classic example of the Mediterranean way of eating, which is in the news–again!. It has barely been out of the news–stories of people living to very advanced ages on Greek islands crop up with annoying regularity on the health pages; annoying in the sense that you immediately want to go there and get a slice of the action–and can’t! 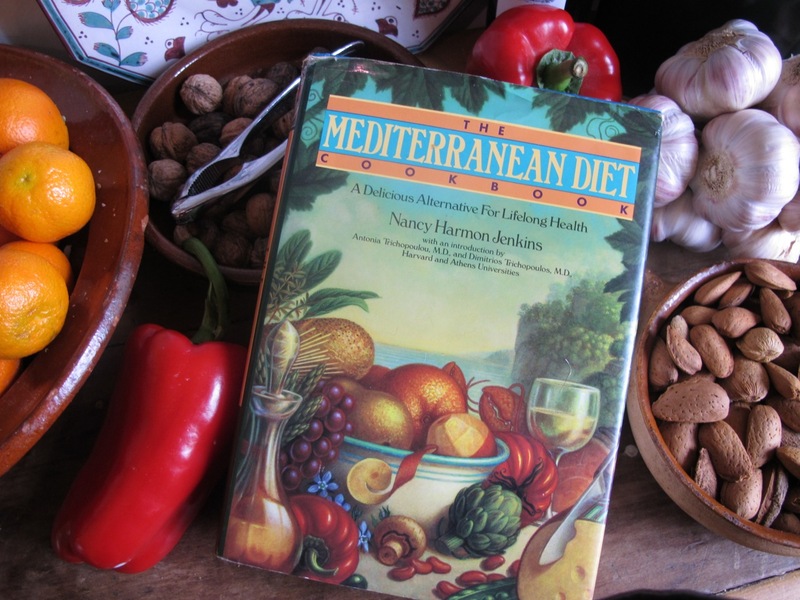 You could though get a copy of food writer Nancy Harmon Jenkins’ wonderful book–The Mediterranean Diet Cookbook–20th anniversary of its publication coming up next year. She has been trumpeting the “Med” way of eating for years. This was Sunday night supper chez nous–inspired by the recipe in her book. Gently heat the oil in a pan large enough to take the pasta too. 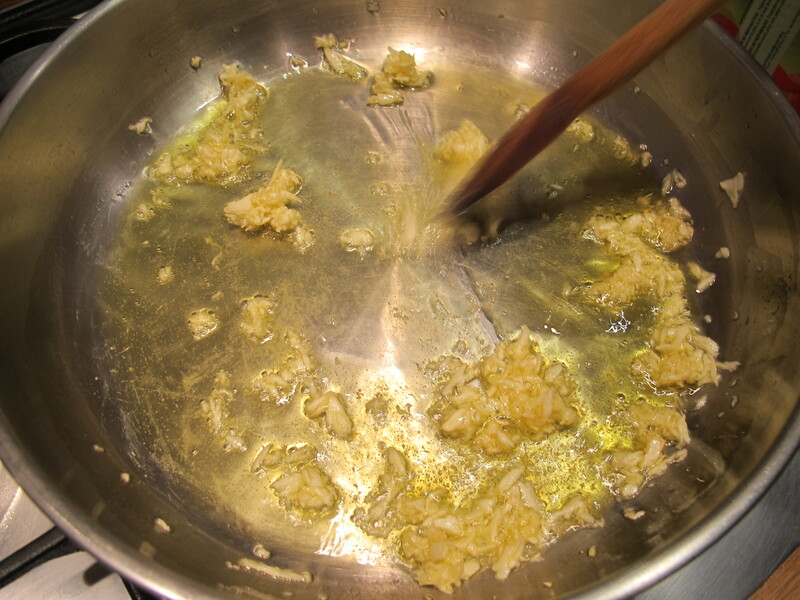 Slip in the pulped garlic and let it colour lightly. Add the chili and the chopped-up tomatoes. 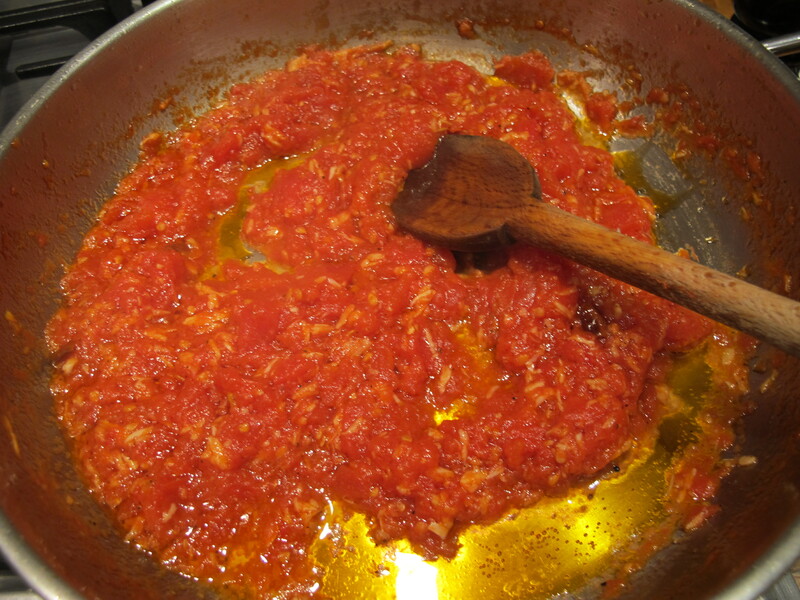 Cook until the sauce thickens–about 30 minutes–stirring regularly. It should be an unctuous pool of red glory. Taste for heat/spiciness—add more if you like. Bring a large saucepan of water to the boil and add a teaspoon of salt. Add the penne, stir to stop the pasta sticking to the base of the pan and bring back to the boil. Cook until it is just tender. 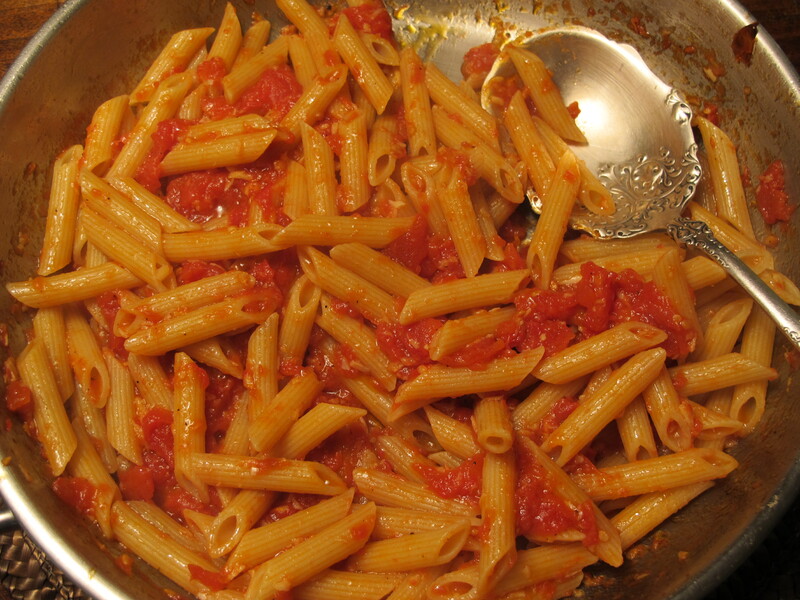 Drain well and add the penne to the sauce and turn it to coat the pasta thoroughly. Serve with grated parmesan if that suits–and a glass of red wine? Also lovely if you add tuna in olive oil, green and black olives, capers and a dash of Balsamic vinegar. This looks perfect for dinner tonight. Thank you! Keep the recipes coming, Robin. We appreciate the time you take, and the photos, too. Minus the chilies, it almost looks like what I made for dinner yesterday. Just discovered “Poldark” and now Nancy Harmon Jenkins. Many thanks, Robin! Sounds like my kinda place! What’s the name of the restaurant or is it a secret?! Hi Norma–thanks and buono appetito! I love your recipes, they always make a springboard for ones I suddenly come up with. For example fennel , I made the gratin then I made a soup with veg stock, saffron, carrots, fennel, celery and roasted garlic. So yummy for these foggy Scottish days. Ah yes, one of my favorite Italian dishes. But the devil is in the details. Cooking with chili peppers is an art form all to itself. And like any art, the taste is in the tongue of the beholder. 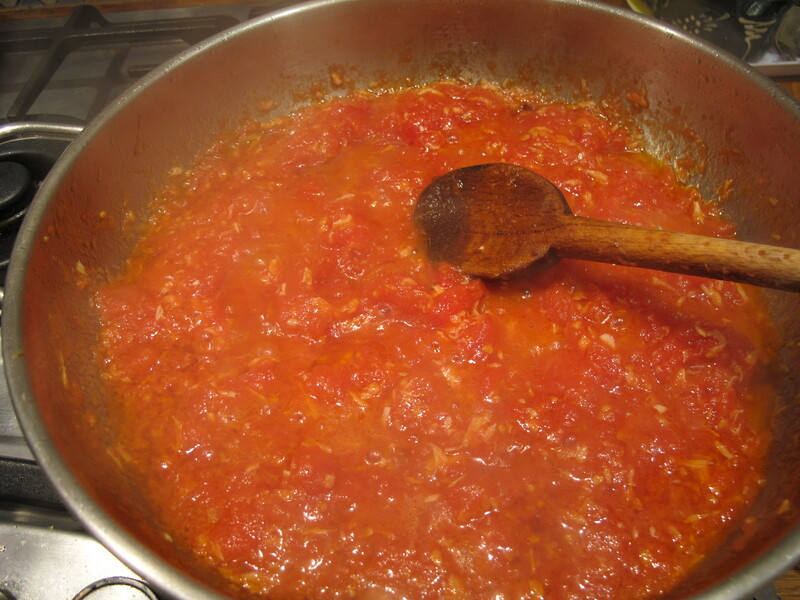 Too much ‘arrabiata’ and you will “a-rob-a-lotta” the enjoyment of this exquisite meal. Thanks Robin, for another vicarious thrill with Med cooking. Give my best to Meredith! Will do Steven! Thanks. Doesn’t need to be vicarious! Ah but…..the secret of the Greek diet – in common with several other remote parts of the world – seemed to be in ‘foraging’ especially during hard times when people actually became healthier. It is the very wide number of foodstuffs people can gather on the wayside that gives a huge range of phytochemicals and antioxidents about which we know very little. We had a friend in Italy who did this when I was young and she lived to a very old age although we never knew quite what it was! It seems like you can eat most stuff that grows if you have the imagination to make it edible. So Robin, a polythene bag and scissors in your pocket on your morning walks! I’ll keep my eyes open! Yum. I will have to make this, but no chili for us, my husband’s tummy cannot deal with even mild chili, and truth be told, no real garlic either. My mother was the same way. Over the years I have found ways to compensate so my food isn’t boring. At least, I don’t think it is! This was simply wonderful. It was the perfect meal this evening for my husband and me. It would have been too spicy for my children, but I can adjust that next time. We loved it! 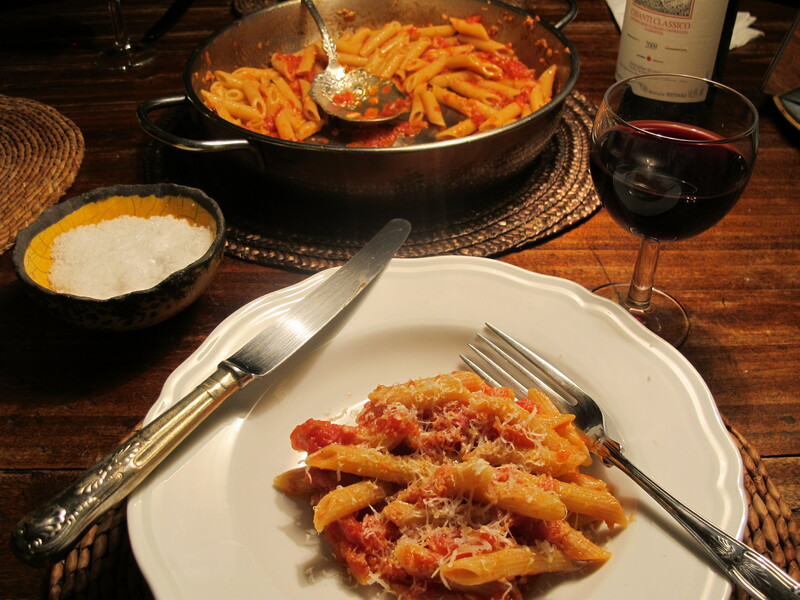 Hi, Robin – I showed the Penne Arrabiata recipe to my husband yesterday, and ended up making it for dinner yesterday evening. Yummers!! The weather was pleasant enough here in So. California to dine al fresco on our apartment patio, and enjoyed the dish dusted with parmesan along with a bottle of cabernet sauvignon. This is now designated as one of our new favorites. Simple, yet very elegant. You are now one of my cooking heroes, and I’m looking forward to trying more of your recipes! Thanks Marlene–sounds like my kinda dining!